This won't damage the moth per se, it will merely attract people from non-foiling classes to foiling. However classy it is, the moth will always be a really hard boat to sail, not accessible to everyone. 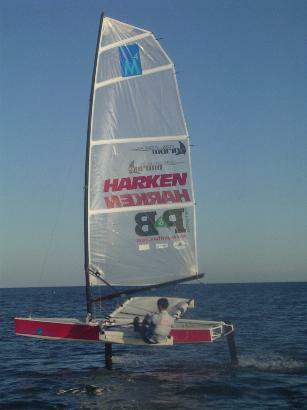 A production foiler would simply bring more people to the idea of foiling. 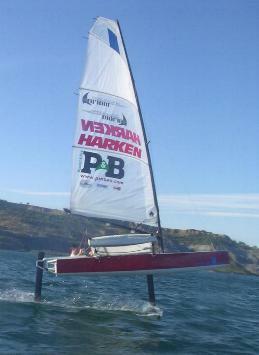 They haven't beaten a path to hobies foiler in great masses, but a bit cumbersome and a different type of foiler ! 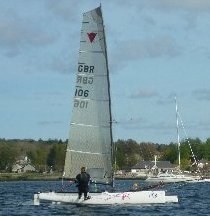 I did say "but a bit cumbersome and a different type of foiler !" as the reason it hasn't caught on or liable too ! Just like the hobie Doh !!!!!!! !, thinking of the tri foiler which was as little success too . I am the M4 designer. I have posted a couple of photos that have not been put on the website yet. I am intrested in all the comments. The project has been formed to try and bring foiling to more people. Hence the 14ft hull, and the racks with pods on the ends. I has to be said this is still very early stages, this is purely the 2nd protoype which is a long way off being the finish product. A lot of work is being done, looking into fesibility, practicality, and how much its going to cost. Max sailing speed 20 knots so far yet to be full tested. Any questions or comments fire away. Whats the sail area in relation to the moth? 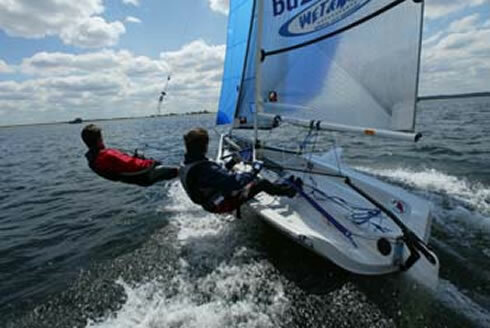 It looks interesting and I guess its a lot easier to sail than a moth. I'm surprised it gets foiling in 7.5 knots of wind the crew must be hollow! I would be most dissapointed with any performance boat that didn't get up and go in this windspeed. When sailing 5.9 and grossly overweight we would be twin traping and flying a hull . up and go in this windspeed. Did you read that the right way.